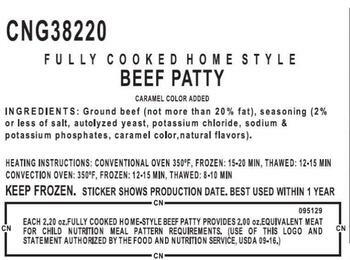 Goodman Food Products, Texas of Mansfield, Texas, is recalling approximately 34,400 pounds of fully cooked ground beef patties. The products may be contaminated with extraneous materials -- specifically hard, white plastic. The recalled products, bearing establishment number “EST. 5886A” inside the USDA mark of inspection, were purchased by USDA Foods for the National School Lunch Program and shipped to institutional locations in Maine and Connecticut. School nutrition professionals who purchased the recalled products should not prepare or consume them, but discard them or return them to the place of purchase. Consumers with questions may contact Donald Goodman at (310) 674-3180.